- the same door frame accommodates reversible doors and/or Rhx and/ or Lhx handed door leaf thanks to Top, Rh and Lh 2.5 cm border profile supplied. This type of shutters features elements made of polycarbonate, a hard and strong plastic material completely transparent, fire resistant, thermally insulating and thanks to our design, also easy to clean. 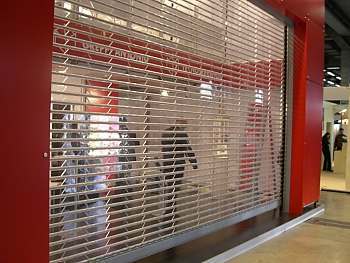 These characteristics allow to produce a type of closure ideally suited for shops located inside sheltered spaces such as shopping centers, airport halls, and similar situations without compromising on security aspects such as fire resistance. Individual components are trapezoidal shape, 85 mm pitch, 345 mm long connected by enameled steel tubing 14 mm dia, concealed into the same elements and acting also as a hinge which allows the necessary flexibility of the shutter mantle needed to roll-up the shutter. The shutter slides inside guides complete of seal supplied complete of supporting brackets. The size of the wounding beam and of its supports vary as a function of shutter dimensions. The transparent shutters can be operated by electric actuators with / without remote control or else manually, as required.